Super Bowl XLIX was an American football game played to determine the champion of the National Football League (NFL) for the 2014 season. The American Football Conference (AFC) champion New England Patriots defeated the National Football Conference (NFC) champion Seattle Seahawks, 28–24, to earn their fourth Super Bowl title. The game was played on February 1, 2015, at University of Phoenix Stadium in Glendale, Arizona. It was the second time the stadium has hosted a Super Bowl, and the third one held in the Phoenix metropolitan area. The Seahawks finished the regular season with a 12–4 record and made their second consecutive appearance in the Super Bowl, having defeated the Denver Broncos, 43–8, in Super Bowl XLVIII, while the Patriots, who also posted a 12–4 record, joined the Dallas Cowboys and Pittsburgh Steelers as one of the three teams to have made eight appearances in the Super Bowl. For the second straight season, but only the third time in the prior 21 seasons, the number one seeds from both conferences met in the league championship game. Seattle became the first team to appear in consecutive Super Bowls since New England won two straight (XXXVIII and XXXIX). After the teams were tied 14–14 at halftime, the Seahawks built a 10-point lead to end the third quarter. The Patriots, however, rallied to take a 28–24 lead with roughly two minutes left in the game. Seattle threatened to score in the final moments, driving the ball to New England's 1-yard line. With 26 seconds remaining in the game, Seattle decided to pass the ball in a highly scrutinized call that resulted in Patriots undrafted rookie Malcolm Butler making a game-saving interception of Russell Wilson's throw. Patriots quarterback Tom Brady was named the game's Most Valuable Player (MVP) after a Super Bowl-record 37 completions on 50 attempts for 328 yards, four touchdowns, and two interceptions. NBC's broadcast of Super Bowl XLIX is the most watched program in American television history, surpassing the previous year's game. The game was seen by an average of 114.4 million viewers, with it reaching to 118.5 million during the Super Bowl XLIX halftime show featuring Katy Perry, and then peaking to 120.8 million during New England's fourth-quarter comeback. The New England Patriots had a rough start to their 2014 season, starting the season with a 2–2 record and hitting a low point with a humiliating 14-41 loss to the Kansas City Chiefs in week four. By this point, the Patriots faced heavy criticism in the media, especially quarterback Tom Brady. Former Patriots safety and teammate Rodney Harrison declared Brady "looked scared to death" in the pocket and "doesn't have any confidence in his offensive line." However, New England recovered with an NFL season long seven game winning streak, beginning with a dominating 43–17 win over the Cincinnati Bengals in week five, and went on to lose only two more games for the rest of the year (the latter of which was done while resting the starters the final week of the season), finishing the season with a 12–4 record and the number one seed in the AFC. They finished fourth in the NFL in scoring (468 points) and eighth in points allowed (313), and had the largest point differential in the NFL (with an average margin of victory of 9.7 points). The Patriots defeated the Baltimore Ravens 35–31 in the AFC Divisional playoffs, and then defeated the Indianapolis Colts 45–7 in the AFC Championship Game. After winning Super Bowl XLVIII the previous season, the Seahawks also struggled to begin the season, floundering near the season's midpoint with a 3–3 record. However, they went on from there to win nine of their final 10 regular season games, preventing their opponents from scoring any touchdowns in five of them. By the time they finished with a 12–4 record and entered the playoffs, they had earned the number one seed, and not allowed any touchdowns in the previous 10 quarters. Their defense ranked first in the NFL in fewest points allowed (254) and their offense was tied at first in rushing yards (2,762). The Seahawks defeated the Carolina Panthers 31–17 in the NFC Divisional playoffs, and then defeated the Green Bay Packers 28–22 in the NFC Championship Game. Seattle became the first NFC team to advance to consecutive Super Bowls since the 1996-97 Packers in Super Bowls XXXI and XXXII. The Patriots had a much easier time in the AFC title game against the Indianapolis Colts. Although the score was still a close 17–7 by the end of the half, New England dominated the game in the second with touchdowns on their first four drives. Brady had another great game, throwing for 226 yards and three touchdowns with one interception, while Blount rushed for 148 yards and three scores. New England's defense held Colts quarterback Andrew Luck, who had thrown for 4,761 yards and 40 touchdowns during the season, to just 12/23 completions for 126 yards. By the end of New England's two postseason games, Brady set new NFL records for postseason passing yards and touchdowns, while coach Bill Belichick set the all-time record for most playoff wins. Seattle had to mount a furious comeback to defeat their next opponent, the Green Bay Packers, as they fell behind 16–0 before Jon Ryan's 19-yard touchdown pass to Garry Gilliam on a fake field goal in the third quarter got them their first score. They still found themselves trailing 19–7 with just over 5 minutes left when Wilson threw his fourth interception of the day. But after Green Bay was forced to punt, Wilson led the team 69 yards to make the score 19–14 on his 1-yard touchdown run. Then receiver Chris Matthews recovered an onside kick for Seattle, and they took their first lead on a 24-yard touchdown run from Marshawn Lynch. Now with the score 20–19, the Seahawks managed to go up by 3 points on a dramatic 2-point conversion play in which Wilson was forced to run all the way back to the 17-yard line near the right sideline before hurling the ball to the opposite side of the field, where Luke Willson, who had only been assigned as a blocker for the play, caught the ball and took it into the end zone. Although Green Bay kicked a field goal to send the game into overtime, Seattle's comeback could not be stopped. After winning the coin toss, the Seahawks took the ball and drove 87 yards to win the game on Wilson's 35-yard touchdown pass to Kearse, sending the Seahawks to the Super Bowl for the second year in a row. Super Bowl XLIX was the first Super Bowl matchup, and the first postseason matchup, between the two teams: while Seattle was part of the AFC before moving to the NFC in the NFL's 2002 realignment, the Patriots and Seahawks had never met in postseason play. It was notable for featuring the coach of one team who had replaced the other coach at one point. Current Patriots head coach Bill Belichick was hired in 2000 to replace Pete Carroll, who is now the coach of the Seahawks. This is only the fourth time this has occurred. The other three times were in Super Bowl III (Weeb Ewbank's New York Jets vs. Ewbank's former team, Don Shula's Baltimore Colts), Super Bowl XXXIII (Dan Reeves's Atlanta Falcons vs. Mike Shanahan's Denver Broncos), and Super Bowl XXXVII (Jon Gruden's Tampa Bay Buccaneers vs. Gruden's former team, Bill Callahan's Oakland Raiders). The only time that the old coach's former team had won prior to this was in Super Bowl XXXIII. Therefore, upon winning, the Patriots became only the second team ever to win a Super Bowl by defeating a team led by one of their former coaches. The Patriots played in the first and latest Super Bowl to be contested in the University of Phoenix Stadium, Super Bowl XLII, when their quest for a 19–0 undefeated season fell short, losing to the New York Giants 17–14. After the AFC Championship Game, ESPN reported an NFL investigation discovered 11 of 12 footballs the Patriots had used during it were under-inflated, while none of the balls used by the Colts had been, although these findings were later shown to be false. Patriots coach Bill Belichick denied any knowledge that the footballs his team used were not inflated to NFL standards. Tom Brady and Bill Belichick became large targets as controversy swirled around what colloquially became known as Deflategate just before the week of Super Bowl XLIX. Ticket prices for Super Bowl XLIX rose quickly, with the lowest-cost tickets reaching over $8,000 by January 29. The average ticket price charged by brokers was $10,352, an increase of more than three times over the previous year's prices. The raise in ticket prices was due to a shortage in comparison to previous years. Jeff Miller, writing for the Orange County Register, observed that the cheapest tickets were nearly as expensive as a year's tuition at the University of Phoenix, and commented that the $28,888 price of seats near the 50-yard line "should not only buy you Katy Perry's halftime show but also Katy Perry singing again from your backseat halfway through your drive home." A Spanish language telecast of the game with Jessi Losada, René Giraldo and Edgar López as commentators was broadcast by NBC Universo—formerly known as mun2, the network's re-branding was scheduled to coincide with the game. NBC also provided SAP Spanish audio over-the-air. As with other major events broadcast by the network, the telecast was cross-promoted with other NBCUniversal properties: various NBC News and NBC Sports programs were either broadcast from Phoenix or featured reports from the game, and Golf Channel cross-promoted the game with its coverage of the Phoenix Open golf tournament and live episodes of Feherty from the Orpheum Theatre. NBC set the sales rate for a 30-second advertisement at US$4.5 million, a price $500,000 above the record set by the two preceding Super Bowls. For the first time, the network also offered 15-second ad spots. A large number of automotive advertisers reduced their advertising during the game, replaced by a wave of fifteen first-time Super Bowl advertisers, including Skittles, Carnival Cruise Lines, Loctite, Mophie, Wix.com, UCool, Jublia, a coalition of Mexican avocado growers, and Always among several others. The network had more difficulty than in recent years selling out the advertisements, with the last ads selling out four days before the game. Paramount Pictures, Universal Studios, Walt Disney Studios, 20th Century Fox and Lionsgate paid for movie trailers to be aired during the Super Bowl. Paramount paid for The SpongeBob Movie: Sponge Out of Water and Terminator Genisys. Universal paid for Fifty Shades of Grey, Pitch Perfect 2, Jurassic World, Minions, Furious 7, and the debut trailer for Ted 2. Fox paid for Kingsman: The Secret Service. Lionsgate paid for The Divergent Series: Insurgent during the pre-game show. Disney paid for Tomorrowland. On October 9, 2014, Billboard announced that Katy Perry would perform at halftime and the NFL confirmed the announcement on November 23, 2014. At the start of the halftime show, on-field participants held up light globes which created a bird's-eye view of the Pepsi logo. Perry entered the stadium riding atop a large, golden mechanical lion, opening her set with a performance of "Roar". She then proceeded to sing "Dark Horse", with 3D rendering on the field creating a chessboard visual where the turf constantly turned into "different shapes and sizes", as acrobats surrounded the singer. 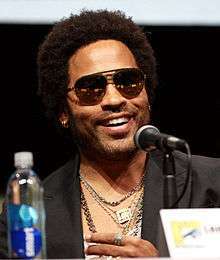 Following this, Perry joined Lenny Kravitz for a duet version of "I Kissed a Girl", which included her "rubbing up against" Kravitz and flames exploding behind them. During these three songs, Perry was clothed in a "flame-adorned" dress, with her black hair in a ponytail. The costume has been described as the "clothing equivalent of a flame", and "dress of fire". The stage and field rendering transitioned into a "breezy" beach setting, with dancers dressed as sharks, palm trees and smiling beach balls dancing around Perry. She underwent a wardrobe change, and progressed into a "campy" medley of "Teenage Dream" and "California Gurls". Rapper Missy Elliott subsequently appeared, performing her songs "Get Ur Freak On" and "Work It", while Perry played "hype-woman" beside her, having now changed once again into a custom Super Bowl 49 jersey. After Perry briefly disappeared, Elliott performed "Lose Control". Perry returned, now sporting a "star-encrusted gown" for her closing song, "Firework". She rose out of midfield on a narrow platform that was attached to a shooting star prop, and flew above the crowds. During this performance, fireworks exploded around Perry and the stadium. The star Perry flew around the stadium attached to was heavily compared to The More You Know's public service announcements logo. After the first two drives of the game ended in punts, New England got the first scoring opportunity with a drive to the Seattle 10-yard line. But on third-and-six, Tom Brady threw a pass that was intercepted by cornerback Jeremy Lane and returned to the 14-yard line. Lane broke his wrist on the play when he tried to break his fall with his arm extended after being tackled by Julian Edelman, and subsequently missed the rest of the game. The game remained scoreless until New England's first drive of the second quarter, which began with Brady's 17-yard completed pass to Danny Amendola. Brady later completed a 23-yard pass to Julian Edelman on third-and-nine, and eventually finished the drive with a 11-yard touchdown pass to receiver Brandon LaFell. Seattle took the second half kickoff and drove 72 yards to the Patriots eight-yard line, featuring a 15-yard run by Lynch and a 45-yard reception by Matthews. After Lynch was stopped on third-and-one in the red zone, Steven Hauschka finished the drive with a 27-yard field goal, giving Seattle their first lead of the game at 17–14. On New England's next possession, linebacker Bobby Wagner's interception of a Brady pass and six-yard return gave the Seahawks the ball at midfield. Just as with their last interception, Seattle lost a player for the game on the play due to injury, this time defensive end Cliff Avril, who departed with a concussion. But the offense was able to take advantage of the turnover, driving 50 yards in six plays and scoring on Wilson's three-yard touchdown pass to Doug Baldwin, who was penalized 15 yards for unsportsmanlike conduct for an improper end-zone celebration. This made the score 24–14, and it would remain this way going into the fourth quarter. Until this game, no team in Super Bowl history had come back to win after facing a fourth-quarter deficit of more than seven points. With 12:10 left in the game, New England mounted a 68-yard drive to cut their deficit to 24–21 on Brady's four-yard touchdown toss to Amendola. The drive included two 21-yard completions from Brady to Edelman, the first one converting a third-and-14 from the Patriots 28-yard line. Following a three-and-out for Seattle, New England got the ball back on their own 32 at the 6:52 mark. Brady started off the possession with two completions to running back Shane Vereen for 13 total yards, and followed it up with a nine-yard pass to Edelman. Following a penalty against New England, Gronkowski caught a pair of passes that moved the team up 33 yards to the Seattle 19. Then Vereen rushed for seven yards, Brady passed to LaFell for seven more, and Blount ran the ball two yards to the three-yard line. Finally, with 2:02 left in the game, Brady gave his team a 28–24 lead with a three-yard touchdown toss to Edelman. After a touchback gave Seattle the ball on their 20, Wilson started off the Seahawks drive with a 31-yard completion to Lynch. Then after two incompletions, he picked up another first down with an 11-yard pass to Lockette. The following play gave Seattle an opportunity to win the game. Wilson threw a deep pass down the right sideline to Kearse, who was covered by reserve rookie cornerback Malcolm Butler. Both players dove through the air for the ball, and Butler managed to deflect it with one hand, but the pass fell right into the hands of Kearse, who tipped it to himself and caught the ball while he was lying on his back. Butler managed to recognize the catch and recover in time to shove Kearse out of bounds as he got up, preventing a Seattle touchdown, but the play netted 33 yards and gave the Seahawks a first down at the Patriots five-yard line with 1:05 left in regulation. Announcer Cris Collinsworth compared the play to two other unusual receptions by Patriots opponents that had defeated them in prior Super Bowls: David Tyree's Helmet Catch in Super Bowl XLII and Mario Manningham's sideline catch in Super Bowl XLVI. Al Michaels also compared it to Antonio Freeman's famous Monday Night Football catch known as "he did what?" (a play that Michaels had himself called). The game was not quite over for Seattle at this point. Since New England was backed up against its own end zone, having Brady take a knee was risky because if he went back too far before kneeling, the Patriots would give up two points and have to kick the ball back to the Seahawks, who would simply need to get into field goal position for a chance to win. This, theoretically, would force the Patriots to try and advance the ball forward while the Seahawks would try to strip the ball. This was rendered moot, however, as Brady's count drew defensive lineman Michael Bennett across the line of scrimmage. Bennett was thus flagged for encroachment and the Seahawks were penalized five yards, which moved the ball to the New England six-yard line and ended the Seattle comeback hope. Brady then took a knee, Seattle called its final time-out, and Seattle linebacker Bruce Irvin rushed some of the Patriots players, starting a brawl involving players from both teams that resulted in an unsportsmanlike conduct penalty for Seattle. Irvin received the first ejection in Super Bowl history for throwing a closed hand punch at Rob Gronkowski. Brady kneeled one more time and the Patriots were victorious. Brady completed 37 of 50 passes for 328 yards and four touchdowns, with two interceptions. His 37 completions set a new Super Bowl record, surpassing Peyton Manning's 34 set the previous year against Seattle in Super Bowl XLVIII. He also surpassed Joe Montana's record for career touchdown passes in Super Bowls, setting a new record that now stands at 13. His top receiver was Edelman, who caught 9 passes for 109 yards and a touchdown, while also rushing for seven yards and returning three punts for 27 additional yards. Vereen caught 11 passes for 64 yards and rushed for 13. For Seattle, Wilson completed 12 of 21 passes for 247 yards and two touchdowns, with one interception, while also rushing for 39 yards. Lynch was the top rusher of the game with 102 yards and a touchdown, and also caught a pass for 31 yards. Matthews, an undrafted rookie who had not caught any passes in the regular season or postseason before the Super Bowl, caught four passes for 109 yards and a touchdown. Wagner had 12 tackles (10 solo) and an interception. Linebacker K. J. Wright had 11 tackles (10 solo). New England became only the fourth team to win a Super Bowl despite losing the turnover battle (after the Baltimore Colts in Super Bowl V and the Pittsburgh Steelers in Super Bowls XIV and XL). In a poll conducted by NFL.com a couple of months after the game, Super Bowl XLIX was voted by its readers as the "greatest game" of all time. The article does report that the voting was structured to try and account for "recency bias" in relation to the game at the time when the poll was conducted, but voters still "pushed it through the competition". After the game, Seattle faced heavy criticism for their decision to call a pass play on second and goal from the 1-yard line with 26 seconds and one timeout left instead of a rushing play. Following the play, Collinsworth stated, "I'm sorry, but I can't believe the call. … I cannot believe the call. You've got Marshawn Lynch in the backfield. You've got a guy that has been borderline unstoppable in this part of the field. I can't believe the call." He further added, "If I lose the Super Bowl because Marshawn Lynch can’t get it in from the 1 yard line, so be it. So be it! But there is no way... I don’t believe the call." Sports Illustrated writer Peter King called the play one of the worst calls in Super Bowl history, as did retired Pro Football Hall of Famer Deion Sanders. Retired running back Emmitt Smith, the NFL's all-time leading rusher, went even further, calling it the worst play call in the history of football. Others, including University of Michigan head coach Jim Harbaugh and Hall of Fame quarterback Joe Namath defended the call, crediting Butler for the play he made and pointing out that the Seahawks only had one time-out left. Writing for Grantland, Bill Simmons said the Seahawks "took too much heat for the final play call" and noted Carroll opted to run the ball on fourth down at the end of the 2006 Rose Bowl, costing his team the game. ↑ Rank is among players with a least 10 attempts and includes performance in the playoffs. ↑ He did not gain a yard on 12 of those attempts, and lost yardage in 9. 1 2 Purdum, David (January 31, 2015). "Vegas books move lines to pick 'em". ESPN. Retrieved February 1, 2015. 1 2 "Super Bowl XLIX officials named; Vinovich to be head referee". National Football League. January 20, 2015. Retrieved January 20, 2015. ↑ "Total attendance for Super Bowl XLIX at 70,288". breakingnews.com. February 2, 2015. Retrieved February 3, 2015. 1 2 "Idina Menzel to sing National Anthem at Super Bowl". National Football League. January 16, 2015. Retrieved January 17, 2015. 1 2 "Katy Perry to headline Pepsi Super Bowl XLIX Halftime Show". National Football League. November 23, 2014. Retrieved November 23, 2014. ↑ "Lenny Kravitz joins Katy Perry for Super Bowl Halftime Show". National Football League. January 10, 2015. Retrieved January 10, 2015. ↑ "ASU marching band practices for Super Bowl pre-game and halftime shows". East Valley Tribune. February 1, 2015. Retrieved February 1, 2015. ↑ "Super Bowl 49 viewership sets US television record". Yahoo. February 2, 2015. Retrieved February 1, 2016. 1 2 3 "Boston Top Market For Super Bowl 49; Seattle Down". Sports Media Watch. February 2, 2015. Retrieved February 3, 2015. ↑ Pallotta, Frank (February 2, 2015). "Super Bowl XLIX posts the largest audience in TV history". CNNMoney. Retrieved February 3, 2015. ↑ Castillo, Michelle (January 7, 2015). "NBC Has Sold 95% of Super Bowl Ads and Says $4.5 Million Per :30 'Is a Steal'". Adweek. Retrieved January 27, 2015. 1 2 Patra, Kevin (February 2, 2015). "Super Bowl XLIX is most-watched show in U.S. history". National Football League. Retrieved February 2, 2015. 1 2 Kissell, Rick (February 2, 2015). "Update: Super Bowl on NBC Draws Record U.S. Television Audience". Variety. Retrieved February 2, 2015. ↑ "K.C. to host 2015 Super Bowl if renovations approved". ESPN. Associated Press. March 5, 2006. Retrieved June 2, 2011. ↑ "No rolling roof, no Super Bowl at Arrowhead". ESPN. Associated Press. May 25, 2006. Retrieved June 2, 2011. 1 2 3 "Tampa, Miami move focus to 2015 Super Bowl after losing 2014 bid". National Football League. Retrieved June 2, 2011. 1 2 "Arizona opts not to bid for 2014 Super Bowl". The Arizona Republic. February 26, 2010. Retrieved June 2, 2011. 1 2 "NFL says Tampa, Arizona are 2015 Super Bowl host finalists". National Football League. April 28, 2011. Retrieved June 2, 2011. ↑ "Owners vote Arizona as Super Bowl host for third time". National Football League. Associated Press. October 11, 2011. Retrieved February 27, 2014. ↑ McClain, John (October 10, 2011). "NFL owners in Houston for fall meetings". Houston Chronicle. Retrieved October 10, 2011. ↑ "What's wrong with Tom Brady?". ESPN. September 30, 2014. Retrieved January 20, 2015. ↑ Schechter, Lee (September 30, 2014). "NBC Sports analyst Rodney Harrison says New England Patriots QB Tom Brady 'scared to death' in pocket". ESPNBoston.com. Retrieved January 20, 2015. 1 2 "Pats erase two 14-point deficits vs. Ravens, into AFC title game again". ESPN. January 10, 2015. Retrieved February 3, 2015. ↑ "Tom Brady carries Pats to rout of Colts, claims sixth Super Bowl trip". ESPN. January 18, 2015. Retrieved February 1, 2015. ↑ "Russell Wilson, Kam Chancellor star as Seahawks roll into title game". ESPN. January 10, 2015. Retrieved February 1, 2015. ↑ "Seahawks rally to stun Packers in OT, clinch return trip to Super Bowl". ESPN. January 18, 2015. Retrieved February 1, 2015. ↑ Brinson, Will (January 18, 2015). "2015 Super Bowl odds/line: Seahawks early 2.5 favorites against Patriots". CBSSports.com. Retrieved January 18, 2015. 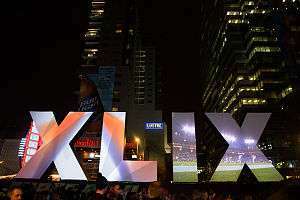 ↑ "Vegas Bookies: Patriots-Seahawks pick 'em for Super Bowl". The Gazette. January 18, 2015. Retrieved January 19, 2015. ↑ "Seahawks-Patriots is pick 'em in Super Bowl XLIX spread". Sports Illustrated. January 18, 2015. Retrieved January 19, 2015. ↑ Purdum, David (January 27, 2015). "Vegas, fans favoring Patriots". ESPN. Retrieved February 1, 2015. ↑ Mortensen, Chris (January 21, 2015). "11 of 12 Pats footballs underinflated". ESPN. Retrieved January 27, 2015. ↑ Jenkins, Sally (July 30, 2015). "DeflateGate's real issue: Due process". The Washington Post. ↑ Ellis, Ralph; Botelho, Greg; Hanna, Jason (January 23, 2015). "Tom Brady weighs in on 'Deflategate:' 'I didn't alter the ball'". CNN. Retrieved January 27, 2015. ↑ Farnsworth, Clare (January 22, 2015). "Thursday in Hawkville: Regardless of whether the Patriots run or pass, the Seahawks will be prepared". Seattle Seahawks. Retrieved January 30, 2015. ↑ Hart, Andy (January 27, 2015). "Ask PFW: On to the Super Bowl". New England Patriots. Retrieved January 30, 2015. ↑ Covitz, Randy (February 1, 2014). "Super Bowl notes: University of Phoenix Stadium roof left open for game". Kansas City Star. Retrieved February 2, 2015. ↑ Hartstein, Larry (February 1, 2015). "Super Bowl 49 big question: Why is roof open for first time all season?". CBSSports.com. Retrieved February 2, 2015. ↑ Root, Jess (January 19, 2015). "Super Bowl 49: Patriots to use Cardinals facility, Seahawks are home team in big game". SB Nation. Retrieved January 27, 2015. ↑ Breech, John (January 29, 2015). "Super expensive: Cheapest Super Bowl ticket costs over $8,000". CBS Sports. Retrieved February 2, 2015. 1 2 Miller, Jeff (January 29, 2015). "Miller: Super Bowl prices out true fans". The Orange County Register. Retrieved February 3, 2015. ↑ "Super Bowl tickets 2015: Still available if you want to spend $9,000 each". The Times-Picayune. Associated Press. January 31, 2015. Retrieved January 31, 2015. ↑ Wray, Cheryl (January 31, 2015). "How much does a Super Bowl ticket cost? More than you can probably imagine". The Birmingham News. Retrieved February 2, 2015. ↑ "Super Bowl tickets soar to $8,000 apiece". WJBF. NBC News. January 30, 2015. Retrieved January 30, 2015. ↑ Kondolojy, Amanda (January 27, 2015). "NBC Sports Presents Six Hours of Super Bowl XLIX Pre-Game Coverage". TV by the Numbers. Retrieved January 29, 2015. ↑ "NBC Universo to Air the Exclusive Spanish-Language Telecast of Super Bowl XLIX". Zap2it. January 27, 2015. Retrieved January 27, 2015. ↑ "NBCU's 'Big Event' Game Plan in Play for Super Bowl". Multichannel News. Retrieved January 28, 2015. ↑ "What it takes for the Orpheum Theatre to prepare for Jimmy Fallon's Super Bowl 'Tonight Show'". Phoenix Business Journal. Advance Publications. Retrieved 8 May 2015. ↑ Smith, Chris (January 16, 2015). "Could a Super Bowl commercial really be worth $10 million? Surprisingly, yes.". Forbes. Retrieved January 19, 2015. 1 2 3 Steel, Emily (January 30, 2015). Newcomers buy ad time at the Super Bowl. The New York Times. Retrieved February 1, 2015. ↑ Horovitz, Bruce (January 7, 2015). "Super Bowl ads still not sold out". USA Today. Retrieved January 19, 2015. ↑ Spangler, Todd (January 21, 2015). "Super Bowl Ads: NBC Turns to Tumblr to Post Spots After They Air on TV". Variety. Retrieved January 29, 2015. ↑ "2015 Super Bowl Trailers: What Ads to Expect During the Big Game Read More: 2015 Super Bowl Trailers: What Ads to Expect During the Big Game". Screen Crush. January 28, 2015. Retrieved January 28, 2015. ↑ "Biggest ever season of American Football coming soon to Channel 4". nfluk.com. National Football League. September 2, 2014. Retrieved January 27, 2015. ↑ "Sky Sports agree five-year agreement with the NFL". nfluk.com. NFL Enterprises. September 25, 2014. Retrieved January 27, 2015. ↑ BBC 5 Live to air Super Bowl XLIX from Arizona. Retrieved January 9, 2015. ↑ "Top 30 Programs (January 26-February 2, 2015)" (PDF). Numeris. February 10, 2015. Retrieved February 17, 2015. ↑ "Weekly Top 10". Broadcasters' Audience Research Board. Retrieved February 17, 2015. Note: The ratings must be searched for. ↑ Knox, David (February 3, 2015). "Monday 2 February 2015". TV Tonight. Retrieved February 17, 2015. ↑ Chowdhry, Amit (January 21, 2015). "NBC To Live-Stream Super Bowl XLIX Free Online Without Requiring A Cable Subscription". Forbes. Retrieved January 27, 2015. ↑ "Super Bowl XLIX on Westwood One". Westwood One Sports. Retrieved January 31, 2015. ↑ "Katy Perry Performing at Super Bowl XLIX Halftime Show". Billboard. October 9, 2014. Retrieved October 9, 2014. 1 2 3 Chase, Chris (February 1, 2015). "Katy Perry blew away the Super Bowl halftime show". USA Today. Retrieved February 1, 2015. 1 2 Peterson, Nate (February 1, 2015). "A recap of the crazy that was Katy Perry's Super Bowl halftime show". CBS Sports. CBS Broadcasting. Retrieved February 3, 2015. 1 2 3 4 5 6 Lipshutz, Jason (February 1, 2015). "Katy Perry Shines During Super Bowl XLIX Halftime Show". Billboard. Retrieved February 1, 2015. ↑ Ishler, Julianne (February 3, 2015). "Lenny Kravitz's daughter mocks him for twerking on Katy Perry". AOL.com. AOL. Retrieved February 3, 2015. 1 2 3 Goodman, Jessica (February 1, 2015). "Katy Perry's Outrageous Super Bowl Halftime Show Includes Missy Elliott Throwback, Lenny Kravitz". The Huffington Post. Retrieved February 3, 2015. ↑ Sherman, Rodger (February 1, 2015). "Super Bowl halftime show 2015: Katy Perry kills it". SB Nation. Vox Media. Retrieved February 3, 2015. 1 2 Blistein, Jon (August 19, 2014). "NFL Asks Musicians for Money to Play Super Bowl". Rolling Stone. Retrieved August 19, 2014. ↑ Karp, Hannah (August 19, 2014). "NFL to Coldplay: Pay to Play the Super Bowl". The Wall Street Journal. Retrieved August 20, 2014. ↑ "Super Bowl XLIX: New England Patriots 28-24 Seattle Seahawks – as it happened!". The Guardian. February 1, 2015. Retrieved February 2, 2015. 1 2 Barnwell, Bill (February 2, 2015). "Super Bowl Wrap-up: What Was Pete Carroll Thinking?". Grantland. Archived from the original on February 2, 2015. ↑ "Baldwin mystery penalty". AOL. February 1, 2015. Retrieved February 2, 2015. ↑ Scott, Nate (February 1, 2015). "Massive brawl breaks out in closing seconds of Super Bowl". USA Today. Retrieved February 1, 2015. 1 2 Hoffmeyer, Evan (February 1, 2015). "Game Day: Patriots win Super Bowl XLIX 28–24". WTHR. Retrieved February 1, 2015. ↑ "Tom Brady rallies Patriots past Seahawks in Super Bowl". National Football League. Associated Press. February 1, 2015. Retrieved February 2, 2015. ↑ Carline, Peter (February 1, 2015). "New England 28-24 Seattle: Patriots win Super Bowl XLIX after Malcolm Butler's last-gasp interception denies Seahawks and gives Tom Brady an elusive fourth NFL championship victory". Daily Mail. London. Retrieved February 2, 2015. ↑ "Looking Back at Super Bowl XLIX Stats and Records". 101Sports.com. Retrieved 2 March 2015. 1 2 "Super Bowl XLIX voted greatest game of all time". NFL.com. April 3, 2015. Retrieved September 10, 2015. ↑ Groller, Keith (February 2, 2015). "NBC's Collinsworth shined as much as Tom Brady on Super Bowl Sunday". The Morning Call. Allentown, Pennsylvania. Retrieved March 22, 2016. ↑ Butler picks off Wilson to seal Patriots Super Bowl XLIX victory (YouTube). National Football League. February 1, 2015. Retrieved February 8, 2015. ↑ King, Peter (February 2, 2015). "The Worst Play Call in Super Bowl History". Sports Illustrated. Retrieved February 2, 2015. ↑ "Deion Sanders: 'Seattle Seahawks made worst call in Super Bowl history'". National Football League. February 1, 2015. Retrieved February 2, 2015. ↑ "Twitter reacts to Seahawks' call to throw on goal line". National Football League. February 2, 2015. Retrieved February 2, 2015. ↑ Eaton, Nick (February 16, 2015). "Jim Harbaugh: Seahawks' Super Bowl pass was good call". Seattle Post Intelligencer. Retrieved February 18, 2015. ↑ Jenny, Vrentas (February 13, 2015). "Joe Namath: 'No One Has Ever Played the Game Better Than Tom Brady'". TheMMQB.com. Retrieved February 18, 2015. ↑ Simmons, Bill (February 4, 2015). "Retro Running Diary: Super Bowl XLIX". Grantland.com. Retrieved February 18, 2015. 1 2 Kilgore, Adam (February 1, 2015). "Goal line play-calling dooms Seahawks, hands Super Bowl to Patriots". The Washington Post. Archived from the original on February 3, 2015. ↑ "Play by Play". National Football League. Archived from the original on February 3, 2015. 1 2 Bonesteel, Matt (February 2, 2015). "Seahawks' Marshawn Lynch isn't exactly money from the 1-yard line". The Washington Post. Archived from the original on February 3, 2015. 1 2 3 4 Corbett, Jim (February 2, 2015). "Pete Carroll takes blame for Seahawks' failure to run Marshawn Lynch". USA Today. Archived from the original on February 2, 2015. ↑ Cwik, Chris (February 1, 2015). "Seahawks' Bevell questions Ricardo Lockette's effort on final play". CBSSports.com. Retrieved February 2, 2015. ↑ Orr, Conor (February 2, 2015). "What went wrong on the Seahawks' final play?". nfl.com. National Football League. Retrieved January 29, 2016. ↑ Blount, Terry (February 2, 2015). "Carroll: Throwing was part of the plan". ESPN. Archived from the original on February 2, 2015. ↑ Leitch, Will (February 2, 2015). "The Seattle Seahawks' Circular Firing Squad". Bloomberg News. Retrieved January 29, 2016. ↑ "SB XLIX Page". pro-football-reference.com. February 2, 2015. Retrieved February 2, 2015. ↑ "Bill Belichick coaching stats". pro-football-reference.com. Retrieved February 2, 2015. ↑ "Super Bowl Leaders page". Pro-Football-Reference.com. Retrieved 10 March 2015. ↑ "Patriots had biggest second-half comeback in Super Bowl history". NBC Sports. 2 February 2015. Retrieved 2 March 2015.